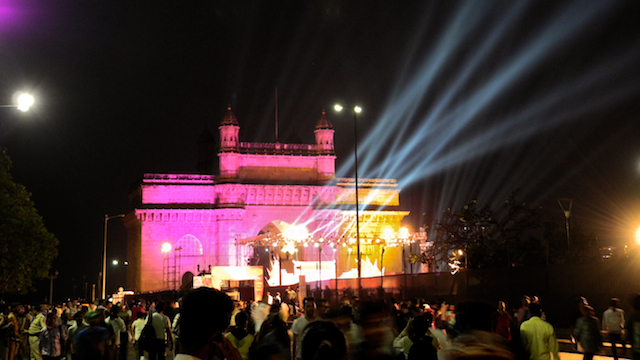 On a recent visit, the Gateway of India was lit up for a Classical Indian Music Program. Other than the loud screeching, jostling crowds and ugly barricades, it was a wonderful evening. Looks beautiful! Do they do this during a certain time of year? This was the first time I saw this light show there. There was a music festival here for the first year and that is why the whole are was cordoned off and the light show. Looked pretty, but a disaster for those living closely and also, hardly any place to walk around. Yes, as it is the area is always congested so I’m sure it was crazy that night. If you had an apartment balcony to look from – that would be ideal! Must have been lovely. We live about a block from there, and the GOI is part of our evening walk; So we are there essentially every day, or at least walking by it. did you see this series of my posts?